Mr. Masamichi Kono was appointed Deputy Secretary-General of the OECD in August 2017. His portfolio includes the strategic direction of OECD policy on Environment, Development, Green Growth, Financial and Enterprise Affairs & Anti-Corruption along with representing the OECD at the Financial Stability Board meetings. Prior to joining the OECD, Mr. Kono was the Vice Minister for International Affairs, Financial Services Agency, Japan (JFSA) and President of the Asian Financial Partnership Center of the JFSA. In that capacity, he represented the JFSA in various international bodies and meetings, and was responsible for coordinating policies relating to international affairs for the JFSA. In relation to this work, he served as Chairman of the International Organization of Securities Commissions (IOSCO) Technical Committee from April 2011 until May 2012, and thereafter as Chairman of the IOSCO Board until the end of his term in March 2013. He was also the Co-chair of the Financial Stability Board Regional Consultative Group for Asia from July 2013 to June 2015, and Chairman of the IFRS Foundation Monitoring Board from February 2013 to June 2016. 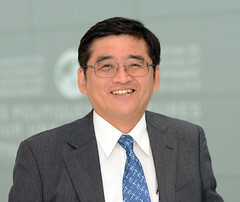 He has had a long career in financial supervision and the regulation of financial services, both in Japan and in the international arena, since joining the public service in 1978. Before joining the Financial Services Agency, Mr Kono was Secretary to the WTO Financial Services Committee between 1994 and 1999, as Counsellor of the Trade in Services Division, World Trade Organisation. He also served for 4 years at the OECD Secretariat in the Economics Department, at the beginning of his career. From September 2005 to March 2017, he was a Visiting Professor at the University of Hiroshima, Graduate School of Social Sciences (Finance Program). He was also Research Scholar at Columbia University, School of International and Public Affairs (SIPA), USA from November 2016 to June 2017.